Viognier (pronounced Vee-Ohn-Yay) is a very special grape and one that must be handled with great care. The Viognier grape/wine is a special treat. It is a wine that has distinct characteristics: perfume, floral notes, and acidity, but it is also a very picky grape. It is very easy to lose to mold and because of this wineries will plant roses next to the grape vines to act as a canary for detecting mildew early on. The grape needs to be picked late otherwise; it does not generate the classic perfume that we are used to seeing in Muscat and Riesling wines. The winemaker has many choices with how he/she wants to manage the grapes. The winemaker can allow the wine to go through malolactic fermentation (to give it a bit more weight) or let the wine lie in the must (to give it more perfume) or to let it have a bit of wood to give it roundness. With all the choices and difficulties that Viognier wines have, they rarely meet expectations and are, therefore, not one of the current popular white wines. Finally, Viognier is not meant for long storage – hence the VERY early release dates on these wines, also the wine should have the acidity, fruit, and perfume to make it a real winner. By default, the Viognier grape is lower in acidity than other white varietals, which makes for a wine that is not meant for cellaring, at least not yet in the kosher market. The most famous of Viognier wines come from Condrieu AOC and though they are highly desired, even there they are not always winners. The climate in Condrieu is colder than much of the Rhone, and its soil is made up of a porous, drainable granite, chalk, mica, and deposits of gneiss. The area is known as the original mother of Viognier and in the AOC, the only legal grape is Viognier. While I really liked the 2016 Psagot Viognier last year, now it is losing its steam and it acid is falling off, making for a fetter more round wine. Dalton, in the past, threw so much oak at the wine that it was built to last longer. Psagot and Kos Yehuos both do not throw that much oak at the wines and they release them early on. Psagot has a fascinating way to get acidity and perfume. Yaacov Oryah, picks around 80% of the Viognier early, for acid, minerality and low alcohol, and 20% later in the season, for perfume. I really enjoyed the 2017 Covenant Israel Viognier, it was varietally true, and really lovely. The sad fact was that I could not find it in Israel, the week before Passover, and I tried almost every wine store in and around Tel Aviv and Jerusalem! I had to come to the USA to taste it, and it is a lovely wine indeed! Still, of all of them, the Kos Yeshuos Viognier is showing a more old world and mineral style than the perfume madness of the Israeli options. It is sad that there are so few options in the world of Viognier. Galil has some, and they are OK but pretty average. Same with the 2016 Yatir Viognier, it was muted to me. The 2016 Dalton Viognier was nice, but it is an oak monster, and that is an acquired taste. Now I stated that there were 7 Viognier wines here in the title, and while there are 5 varietal Viognier wines, the other two are blends. The first of the blends is the 2017 Shirah Vintage Whites which is a blend of 55% Viognier and 45% Chardonnay, from the Murmur Vineyard in Santa Maria Valley. The last of the blends is the 2017 Teperberg Fermitage White, Inspire. Classic viognier notes with crazy rich floral notes, with rich saline, lovely peach, and some oak. The mouth on this medium bodied wine is really fun and showing a lovely oily texture, with rich weight and more fun saline, followed by apricot rolled in the grass, with floral notes. The finish is sweet and ripe and fresh with tart notes of stone fruit, with lemongrass and flint. Bravo! This year’s vintage is leaner than last year’s vintage, but also more light in style and focus. The wine starts off very ripe and needs time to come around, give this wine time. The nose starts off with ripe fruit notes of pineapple juice, honeycomb, really ripe, with cloves, allspice, peach marmalade, and apricot, and stone fruit. With time the nose turns to nice mineral notes, backed by peach marmalade, wonderful peach jam, and lovely hay, quince jam. The mouth is more round and fat than I would have hoped, with orange and nectarines, still, it is well structured. With slate, saline, and pith galore. Nice. Do not cool this wine too much, it likes 30 min in the fridge and no more. This wine has evolved over the past 6 months. Gone is the fruity nose and now the nose is pure flint, yeast, smoke, and really fun straw and mineral, with peach and honey in the background. The mouth on this medium bodied wine is ripe for sure, but really well balanced and showing lemongrass, with a rich oily coat that covers the mouth, well focused with rich acidity, nice mineral, great fruit pith, apricots, peach, and lemon, with rock, and grass. The finish is long and acidic, with enough complexity to grab your attention and keep it throughout the finish with lovely white rose tea, sweet spices, notes of fresh lavender, crazy saline lingers super long, with cinnamon, and cloves. Bravo! So last year this wine was very ripe, now the nose is showing nice funk, with hay, straw, and honeyed notes. last year this wine was an acid bomb, now the wine has lost that rich acidity and now it is well balanced, with good fruit pith, and green notes, and not much else. Sadly, this wine is losing its grip and should be drunken ASAP. DRINK UP! This wine is a blend of Viognier, Sauvignon Blanc, and French Colombard. The nose on this wine is very floral and classically inclined to Viognier with its intense peach bomb notes, with white cherry notes, and sweet Oak. The mouth on this medium bodied wine is oily and tactile, with a rich weight from the Viognier and Colombard fruit, with sweet Guava and nectarines, followed by with orange notes, The finish is sweet and tart and fun overall, with good acid and floral notes. Nice! Another winner from Shirah with a blend of 55% Viognier and 45% Chardonnay. The nose on this wine starts off really fun and funky, showing straw and rich mineral, with sweet peach, rich ripe guava, and apricot. The mouth on this wine is really fun, rich, layered, well balanced, oily and textured, and so professionally made, with lovely smoke, oak, with rich apple, dried quince and with fresh focus and lovely weight and viscosity. The finish is crazy and dry, with sweet notes of fig, sweet lemon tea, with intense mineral and lovely pith with a citrus background. Bravo!! The nose is classic Viognier, with peach, too much oak, showing good apricot, sweet rose hips, and a perfume of honeysuckle, and orange blossom. The mouth is medium bodied, with a nice almost oily mouthfeel, showing nice weight, with good notes of summer fruit, with just enough acid, wish there was more, with lovely pear and nectarines. The finish is long and balanced with less acid than before, still too much oak, lovely mineral, slate, and more floral notes. Drink up! 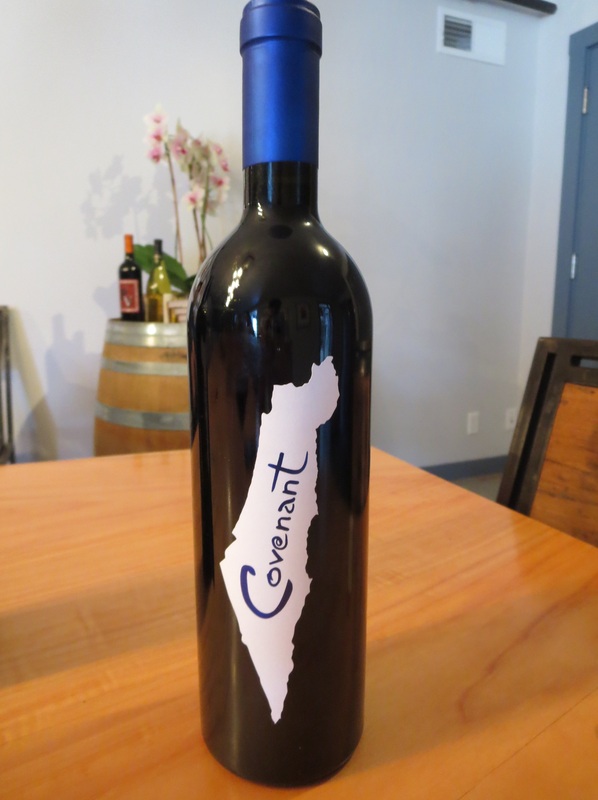 When I think of Covenant Winery, what leaps to mind for me, is Jeff and Jodie Morgan, Jonathan Hajdu – Covenant’s top-notch associate winemaker, and their world-class kosher Covenant Cabernet Sauvignon, Lavan Chardonnay, and Sauvignon Blanc. Sure, they also make a lovely and unique Red C wine, rose, and Landsman series of wines, but that is what comes first to mind. When I first met Jeff and Jodie, it was at Herzog Winery, in 2006 where Jonathan Hajdu and they were pouring their wines at the first ever Herzog IFWF on the west coast. Since then I have made it my business to go to the winery at least once a year and meet with the Morgans and to taste their wines. I state that very specifically, as I have found that wines do follow their creators, and the open and accessible Covenant wines that also age to perfection, intrigued me and I wondered what their creators were like. If you have had the opportunity to meet with Jeff and Jodie Morgan you will find two people who are passionate about their Jewish roots, though more traditional in nature than Orthodox, but still two people on a spiritual journey with their wines as their guides. From the start they decided that their wines would be kosher, and that they would be creating wines that were mimeographs of themselves, whether they realized that – or not. To be honest, this article is a long time coming, a post that I think is more about my relationship with the Morgan’s, Mr. Hajdu, and their wines, and less about their story. The now famous story about Lessie Rudd and his grapes, his apprehension to letting the Morgan’s use his grapes, as he feared that they and their kosher process would ruin them, has been written about over and over. Humorously, the fact that the story is in every post about Covenant wines, and that the story is so well-known and repeated, is once again a representation of the wine and Jeff – both are wonderfully gregarious while also being quiet but confidently capable of spinning a tale of what they both have to offer. Sure, when you meet the Morgans, and trust if you come to the KWFE in NYC – you will meet them, you will find two lovely, affable, and equally impressive humans that have honed their skills, with care and effort. However, it takes a bit more to see beyond the initial blustery interface, and to get deeper into what they see in the future. Yes, they are always looking forward to what the winery can become, but it is far more interesting to get to the story behind the tales, the story of a couple who are equally passionate about their tradition and history as they are about their impressive with their skills and craft.